Note that apple green tip should occur app. 101 DD (Base 43), although obviously there is a range. We reached green tip on 31-March in Belchertown. Based on Base 43 DD's of 184, we should be at app. 1/4 inch green tip. Actual, green tip (Honeycrisp) to 1/4 inch green (McIntosh) to 1/2 inch green (Zestar! and Cripps pink). 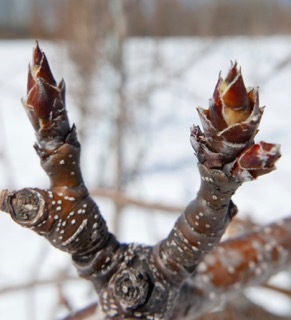 19-April, 2016 (Tuesday) Fruit Twilight Meeting at UMass Cold Spring Orchard, 393 Sabin St., Belchertown, MA. 5:30 PM. 1 pesticide credit will be offered. Light dinner will be served. $20 meeting fee. Contact: Jon Clements, 413-478-7219. Pre-registration is not necessary. • This WILL BE your last Healthy Fruit (HF), unless go to the UMass Extension Bookstore (http://umassextensionbookstore.com) and purchase a new 2016 subscription to HF ($50, e-mail delivery only) in the next week or two. Alternately, you can send me (Jon Clements, 393 Sabin St., Belchertown, MA 01007) a check for $50 made out to 'University of Massachusetts.' Make sure you note it is for Healthy Fruit subscription, and includes your e-mail address. 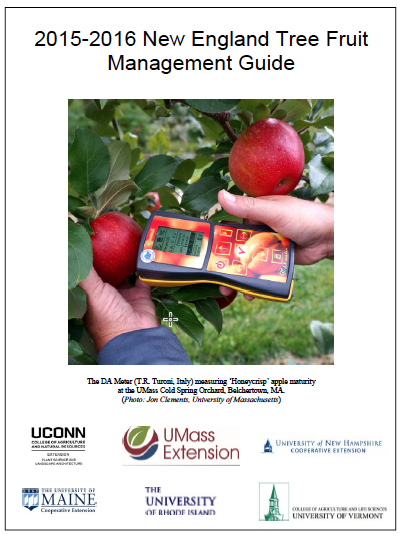 You can also use this mail-in form to order Healthy Fruit and other UMass fruit publications. You can ignore this of course if you have already sent in your payment. Thanks. • The weather is now NOT arguably challenging! It's downright ODD and FRUSTRATING. One month ago, on March 8-9, the high/low temperature in Belchertown was 78/60. THIS weather should have occured one month ago and I would be OK (well maybe) with the early March weather now. So, what are you going to do? Nothing. We will be flirting with temperatures that could cause damage to developing flower buds, but it depends on a lot of things. 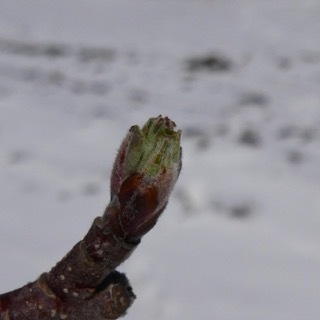 Bud stage, temperatures before the drop, how much hardiness was lost, how cold it gets, how long it gets cold, effect of wind on exposed green plant tissue, etc. I'd be feeling good if I had purchased a good level of crop insurance last November, maybe not so good otherwise. But we'll see, no predictions yet. (Besides, we're still six months from getting the crop off the trees.) Here is "good" reading (maybe that is not the right terminology) from Mark Longstroth at Michigan State University. 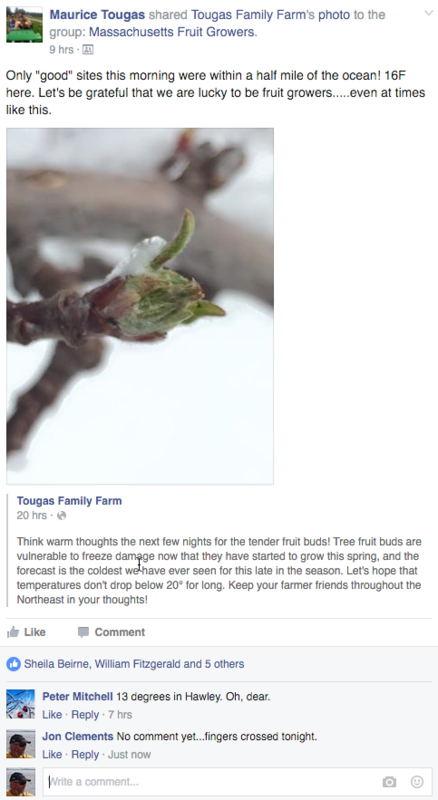 Mark has spent quite some time dealing with frost/freeze damage to fruit crops. 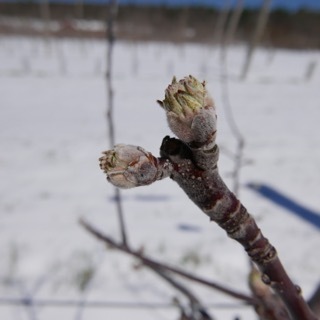 • All that being said about freeze damage to apples, your best (and likely only) remedy at this time is a spring "tonic" spray of boron, zinc, and urea (nitrogen) once things warm up a bit. I would target tight cluster with the boron (Solubor @ 1 lb. per 100 gallons dilute spray) and zinc (Zinc EDTA chelate, follow label or 1 lb./qt. per 100 gallons dilute spray), and then nitrogen (feed grade urea at 3 lb. per 100 gallons dilute spray) at pink and again at petal fall (increase to 5 lb.). • I am not sure when the next Healthy Fruit will be out as I am off and traveling out-of-state next week. It may be comprised of Healthy Fruit 'chunks.' 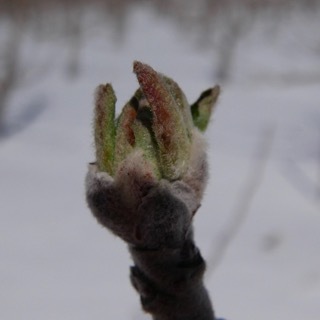 Expect a full Healthy Fruit on or before April 19. 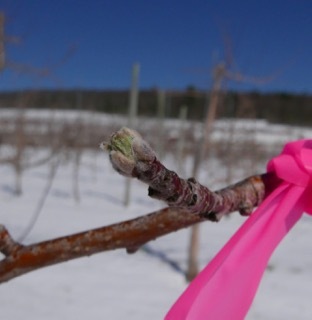 • Seriously, not much happening right now, although Heather Faubert tells me most winter moth eggs have hatched and the cold will only slow down (but probably not eliminate) winter moth movement into orchards. Be prepared to treat when the weather warms up. Below is her latest update. Also, in case you missed it, pear psylla adults were quite active in two orchards I visited last week. Freshly laid eggs were easily found. Oil spray(s) are you best friend here. (But not until it warms up.) Rates as low as 1% can be effective egg-laying deterrence and can smother laid eggs (with good coverage). Some insecticide action may also be necessary. Various pyrethroids, Centaur, Esteem, Exirel are recommended. Consult label for rates and details. Also, here are a few snippets from management recommendations provided by Michael Myers (Nichino America) and Penn State University for your reference. 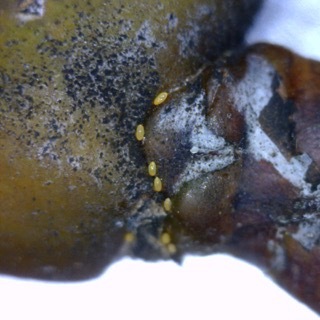 Be prepared to resume treatment for this pest (if it is a problem in your pears) when the weather warms. 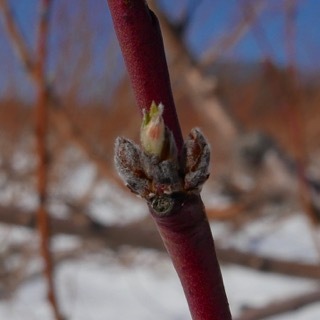 Females begin laying tiny, pear-shaped, yellowish eggs in cracks in the bark and around the buds in late March and continue through the white bud stage. The peak of egg laying is green tip to green cluster bud. Eggs hatch in 2 to 4 weeks. Orchards with a history of severe psylla infestations should receive an intensive insecticide program beginning in the dormant period. To prevent egg laying, oil should be applied in mid-March to early April, depending on the location in the state. At green cluster bud, a treatment of oil plus a pyrethroid compound should be applied. So, why use controls that kill adults (pyrethroids) now? One female can produce as many as 650 eggs. The peak of egg laying is green tip to green cluster bud. 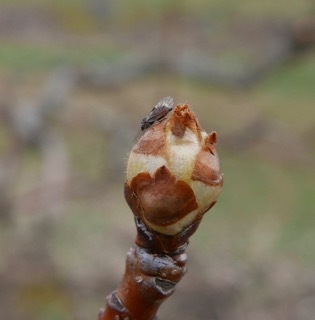 Eggs hatch begins at the green cluster bud to white bud stage, with peak hatch occurring about petal fall. Heavy infestations may cause partial to complete defoliation of trees, reducing vitality and preventing the formation of fruit buds. Return bloom and fruit set are often reduced the following season. Overall tree growth can be stopped or stunted with heavy psylla injury. These combined effects are often termed “psylla shock.” There is also limited evidence that psylla inject some type of toxin into the tree, causing a disease known as pear decline. In addition, pear psylla have been implicated in the transmission of fire blight. *[http://extension.psu.edu/plants/tree-fruit/insects-mites/factsheets/pear-psylla]. So, what does Penn State say about oil? The first application should include oil, which has been shown to delay egg laying by over 95 percent for a 5-week period, plus an adulticide to eliminate adult psylla overwintering on the tree. This application also serves to concentrate in time a higher proportion of pesticide-vulnerable individuals later in the season. Typically, egg deposition and hatch occurs over a long period of time, making pesticide timing difficult. Early season oil sprays “bunch up” the population so sprays can be more easily targeted. The early season oil application must be applied prior to egg maturation in the female psylla. For growers in south-central Pennsylvania, this application should be made in most years by March 15–20. I checked my monitored winter moth eggs in Kingston this morning. Most eggs have hatched. I don't think it makes sense to try and spray for winter moth this week unless your fruit trees and blueberries are right near the ocean. 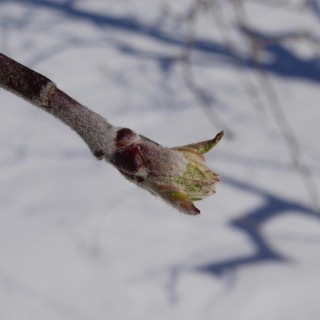 The next chance to spray apples, pears, and blueberries will be in a couple of weeks (or longer if cool temperatures continue) when buds open up a bit and caterpillars are climbing around. When caterpillars are inside closed buds like they are now, insecticides can't reach them. What are cold temperatures going to do to winter moth caterpillars? I'm afraid caterpillars will survive better than flower buds. I will check bud survival and caterpillar survival at the end of this week. Now is not the time to spray landscape trees. 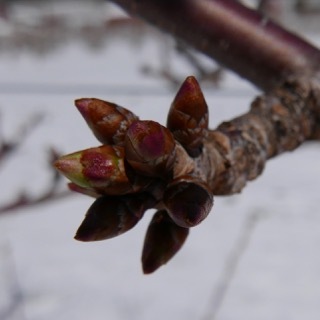 Wait for leaf buds to open and new leaves emerge. Let’s assume for now, after last night’s temperatures in the teens, that we still have apples to worry about. The pieces are in place for scab infections once the snow melts and it rains, probably on Thursday. 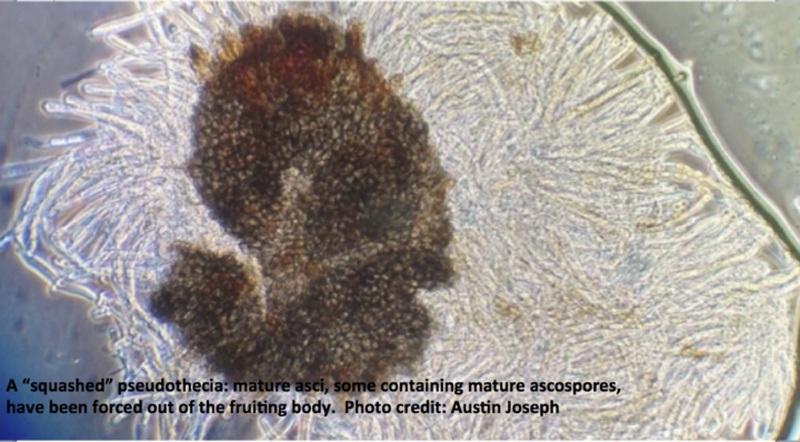 Most trees are showing some green tissue, and mature spores have been released in our tests at UMass (see the ascospore maturity report below). If it is wet for long enough on Thursday, there will be an infection in many areas in MA. The problem of what one should do is complicated by the cold weather. Temperatures tonight, Tuesday, will probably be low enough to damage apple buds, and some cold damage may have hit them already. Copper, captan, Syllit or oil should not be used on cold-damaged tissue. These chemicals can make cold damage worse. Wait at least 4 or 5 days to give tissue time to recover from cold stress. Try not to look towards Saturday when it may get to damaging cold levels yet again. The safest approach fungicides to use now are mancozeb, Polyram, Vangard, Scala or Inspire Super. Ideally, for purposes of resistance management, these should go on before any infection, but the weather does not look good for spraying. If used after infection, a combination of mancozeb plus either Vangard, Scala or Inspire Supers would have at least 48 hours of post-infection activity. Waiting until after the rain will also give a read on whether or not an infection actually happens. A spray may not be needed. What should be done about copper if it hasn’t been applied yet? Spraying copper on cold-damaged tissue risks some tissue burn. Not applying copper increases the risk of fire blight later in the year. It may be best to make sure that streptomycin is at the ready around bloom, and avoid copper for the next week. Copper should not be applied any later than half-inch green. A little snow couldn’t keep us from our ascospore maturity tracking. After digging leaves out from under the awful white stuff, here is what we found (for a description of how the various tests are performed, please take a look at last week’s Healthy Fruit disease section. In the squash mount assay (see photo below), the percent of asci containing mature ascospore was 6.3%, down from last week’s 13.7%. The rain we experienced over the weekend yielded no ascospores in the field based two-fan trap. What really caught my eye today was the number of spores caught in the lab tests. Our scabby leaves shot 48 mature ascospores onto the slides in the petri plate assay. Even more troubling, however is the number of spores caught in the funnel trap, a grand total of 196, yikes! At least, it would be “yikes” if we hadn’t gotten several inches of snow on Monday. Thankfully, ascospores cannot tunnel through snow (I promise). So, while scab season is progressing, we can find at least one reason to be thankful for Monday’s storm. The next Healthy Fruit will be published on Tuesday, April 19 or thereabouts, 2016. As always feel free to get in touch with any member of the UMass Fruit Team (http://extension.umass.edu/fruitadvisor/team-members) if you have questions or comments.